Sony has a long history in India than is actually acknowledged. In 1994, the company established one office in New Delhi to promote and market their products to Indian consumers. Back in those days, there were no personal computers in everybody’s homes but at least one of us might have had a relative who used to carry a video camera that was manufactured by Sony. At least one of us might have had Sony Walkman around and of course, let us not forget Sony’s TV series. Sony’s entry in India was at a time when the technology around was fast developing into the future we have today. People were getting used to computers, video cameras and mobile phones. It was back in the 1997 that Sony made a debut in the world of portable computers with the introduction of their first ever VAIO notebook. We have seen a major makeover in the field of computer technology ever since then and now, the competition is to create faster, better and amazing notebooks, and do so year in, year out, or be out of business. Even back then, Sony managed to make the lightest and slimmest notebooks. The concept of a PC was already firmly engrained into by the late 90s and portability was starting to pose a problem. A lot of companies started to offer portable PCs called laptops. This was the time during which the first portable computers were making an entry into our world and over time laptops became slimmer, lighter and faster and eventually got a new name – notebooks. 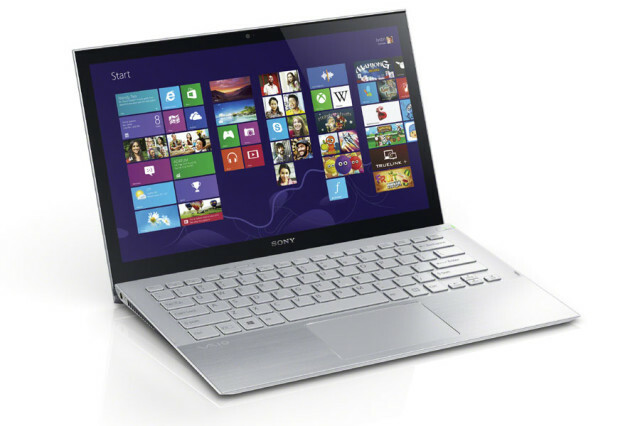 Sony has always offered sleek and beautiful notebooks, and has also gotten on the Ultrabook bandwagon last year. Ultrabooks are a hybrid of tablets and notebooks and it looks like they will be the future for both these categories. One such offering is Sony’s VAIO Duo 11, which comes with a unique design and is quite slim. It comes with the latest hardware in the form of a 11.6 inch LED-backlit full HD touchscreen, Intel’s 1.7GHz Core i5 (3rd generation), 4 GB RAM, 128 GB flash memory and Intel HD Graphics 4000 with Windows 8 pre-installed. The Duo 11 features a design that is called Surf Slider. In this design form, users can use the device as a tablet which includes gesture recognition and multi-touch. Users who want to use this device as a full-fledged notebook can do so by sliding out the keyboard. Of course, Sony didn’t just stop there and released a slimmer and lighter hybrid series with the VAIO Pro. This series includes 2 variants, an 11-inch and 13-inch variant, and Sony has come out and said that the goal for these machines is to go head-to-head with the Macbook Air. The 11-inch variant comes with Intel’s Haswell Core i5 (4th generation) at 1.8GHz, Intel HD Graphics 4400, full-HD screen, 512GB SSD, 4GB RAM and a design that features heavy use of carbon fibre. The 13-inch model features slightly better hardware, but the differentiating factor that sets these Ultrabooks aside from others is the design. Both models are lighter than the Macbook Air, and are also thinner and look sleeker. The backlit keyboard is also a delight to use. It is clear that Sony has gone to great lengths with these 2 Ultrabooks to ensure that they not only have a strong contender in the market, but also one that beats everyone else at their own game. Also, the fact that these models come with Haswell should mean that there should be a significant gain when it comes to battery utilization and battery life. These models should be available in India over the next quarter and to get to know of its availability in the country, Sony laptop price list is a good location to start as it contains all the models that are currently available in the country. Sony has come a long way since it started in the country. The scenario is different from when it first it made its way onto Indian shores. Now, for every category of electronics, there are around 5 to 6 manufacturers that are intensely contesting to be the best at what they do. What we can unequivocally say at this juncture is that such intense rivalry amongst manufacturers is ultimately good for the consumer in that it creates a lot of choice.